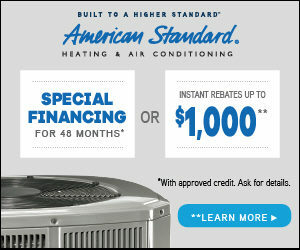 Americans Standard is offering a spring promotion, including a $1,000 rebate on select systems or 0% financing for 48 months. Is it time to replace your old, worn-out heating & cooling system? If your heating & cooling equipment is more than 10 years old or isn’t making your home as comfortable as you’d like, consider installing a high-efficiency system. Ask us about the Duke Energy Rebate.